Writing a thank-you card can seem challenging no matter whom you are writing to. When addressing a priest, it is easy to feel even more anxious about what to write, as you want to show your gratitude without being disrespectful. Regardless of why you are writing, it is important to be honest and to keep your message concise. Purchase or make a thank-you card and envelope. You can find thank-you cards in any card shop, major pharmacy, or grocery store. It is best to choose a card that is simple and has minimal writing inside the card to allow space for your own message. Begin by addressing the priest formally by writing Father and the priest’s last name. For example, if your priest's name is John Smith, you would address him as Father Smith. "Father" is an appropriate title for Roman Catholic or Eastern Orthodox priests. It is not appropriate to address the priest by his first name, unless you know he prefers to be addressed that way. State immediately why you are writing. Express your appreciation for the recipient's involvement in this matter. 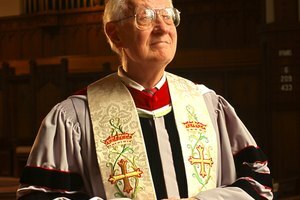 In an online forum post on writing thank-you notes, Leslie Harpold suggests “mentioning the past and alluding to the future.” This can be as simple as saying it was nice to see the priest at a recent event, and that you look forward to seeing the priest at an upcoming service. Close your message by restating your appreciation and signing the note, preferably with your first and last name. 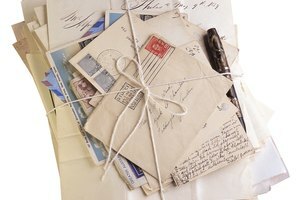 You can write "Sincerely" and your name; however, it is best not to refer to God or offer divine blessings, as this may be insulting to the priest. You can personally deliver your note to the church or send your card through the mail. While many people find electronic or ecards acceptable, sending an actual thank-you card in the mail is more personal. There is no minimum or maximum length for your message, but be sure that you are concise. 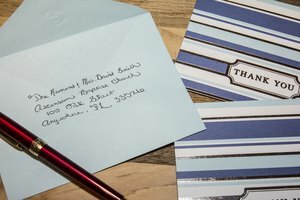 Depending upon how close you are with the priest you are writing to, you can choose to include the priest’s first name on the envelope or in your card greeting. If you are unsure of the spelling of the priest's name, you can look to a recent church bulletin or call the church secretary to inquire about the correct spelling. If your priest has quoted a specific passage from Scripture that you have appreciated, you can use this as a inspiration for your own words, or even include it with your message as a way to explain your gratitude. "The Morning News website: How to Write a Thank-You Note"
Faller, Mia. "How to Write a Thank You Note to a Priest." Synonym, https://classroom.synonym.com/how-to-write-a-thank-you-note-to-a-priest-12079897.html. 29 September 2017.